Our secure payment provider is MyCommerce, a reputable global e-commerce provider for software sales via the Internet. When you click on "Buy NOW!" you will be redirected to their secure site where you can complete your order. First you have to find out your ELINGO ID number. This number you have to enter to order form. Upon successful order a serial number will be sent to you by email. To purchase eLingo via PayPal first you need to enter the ELINGO ID number down below and click on the buy now button. After purchase is successfully finished the serial number will be sent to you by email. This serial number is needed for registration of your copy of Fitness manager. After registration your program becomes fully funtional without any limitation. 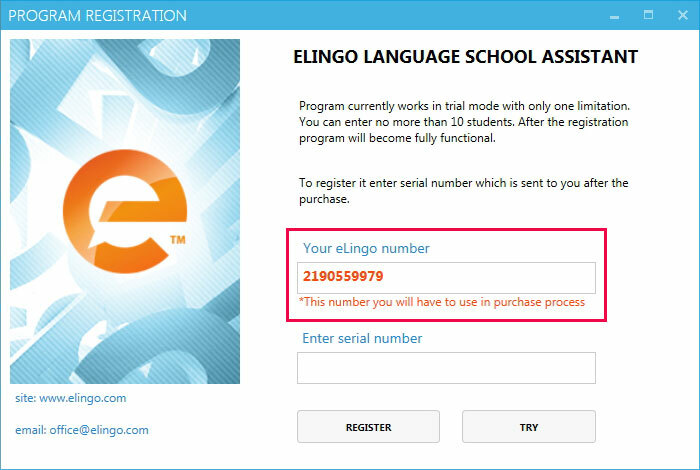 First download ELINGO and install it on the computer in your school. When you start the program, registration form will show up and you will see your ELINGO ID number. This number is related to your computer and is needed in ordering process to get your serial number. When you get serial number you can register your program and it becomes fully functional.